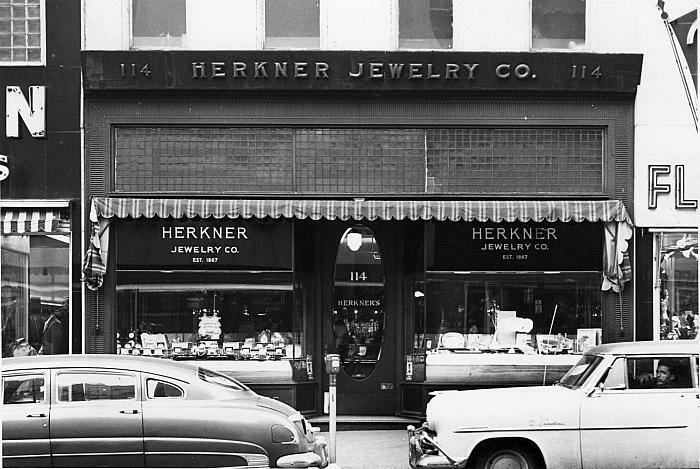 A view of the Herkner Jewelry store front at 114 Monroe with two early 1950s automobiles parked at the curb, a Hudson on the left and a Ford Crestline on the right, and a parking meter can be seen between the two cars. Signs above the windows on both sides read Herkner Jewelry Co., Est. 1867. Title by cataloger. Back of the photo has Bernard M. Birndorf, 621 Giddings SE. City directories list him at this address for the years 1954-55. Herkner moved his store in 1889 to from 25 Monroe to 57 Monroe which became 114 Monroe after city streets were renumbered in 1912. This store was near the NW corner of Ottawa and Monroe and had a second entrance on Ottawa.